This game tests your knowledge of fractions. 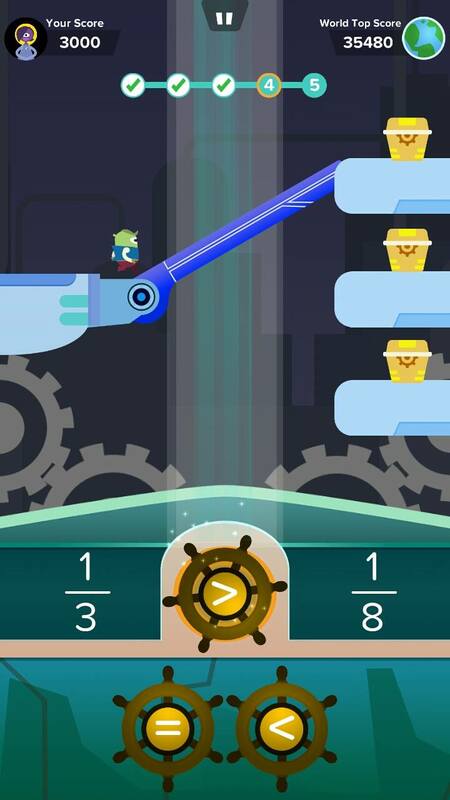 The game enhances your math mastery by providing you with a lot of fun practices. Likewise, nice graphics and eye catching images are used to ensure you enjoy your learning process. Besides making you feel entertained, the Gears fractions game lets you practice fractions by choosing which gear to put in between the inequality relation. You will need to drag the right gear in place to verify whether the fractions are more than, equal to, or less than the other. So what actually you should expect after playing this game? Upon finishing playing it you will be able to master many exercises related to fractions in a more simpler and efficient way. Besides that, fractions game is composed of tutorial at the beginning of the game so as to enable you to understand how to play it. However, we recommend you to understand the tutorial before you get started the game so as to make sure that you manage to get higher scores during your play. Did you find your way to become a math pro? Did you find it interesting and satisfying to learn math and reach your goals? If so, dive into our links to enhance your math mastery today. However, do give us a 5 star rating on the Apple Store or Google Play and remember to share your enjoyment with your friends and relatives. Moreover, do not hesitate to tell us how you feel after playing Zap Zap Math games. Any feedback would be greatly appreciated and we would love to hear from you how we can improve Zap Zap Math. Together We can make learning math become fun and effective for our children.